TOKYO (Reuters) - Japan's convenience store operators are jostling for eminence in a famously cut-throat industry, and one product has come up trumps for the market's top players - coffee. 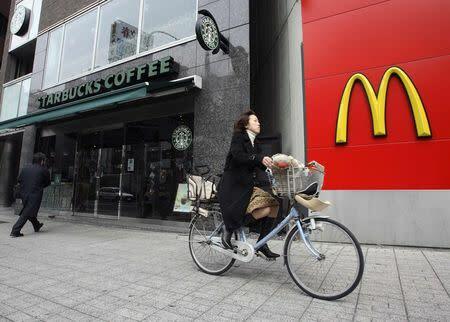 Inspired by a popular 100 yen (0.58 pounds) blend launched by McDonald's <2702.T> in 2008, Seven-Eleven <3382.T> touched off a boom in convenience store coffee last year, lifting Japan's long-stagnant coffee market and rankling rival businesses. Late last month, Lawson <2651.T> became the latest convenience store chain to offer 100 yen coffee, a move that its president says has already buoyed sales. "The impact of coffee on customer traffic is huge," Lawson President Genichi Tamatsuka said recently. 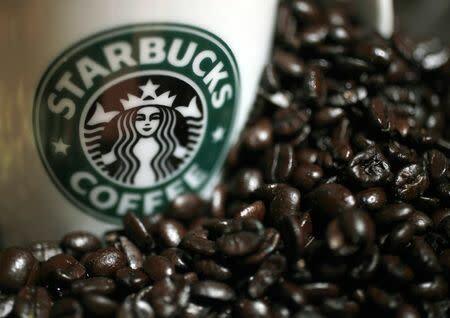 As convenience store coffee heats up Japan's 1.3 trillion yen (7.42 billion pounds) coffee market, Starbucks Coffee Japan <2712.T> is planning to step up its premium teas and ready-to-drink products. Lawson changed that in January 2011, starting its over-the-counter drinks service with a menu ranging from blends to lattes to teas. FamilyMart's self-service espresso machines were launched in late 2012, offering coffee, lattes and frappes. But it wasn't until January 2013 that Seven-Eleven gave rivals a jolt with black coffee that was not only low-priced but also considered high quality. The 100 yen, grind-on-the-spot all-Arabica "Seven Cafe" ignited a coffee war that has intensified as FamilyMart <8028.T> and Lawson matched the price. The popularity of "conbini coffee" - Seven-Eleven alone aims to sell 600 million cups in the year to February - pushed coffee consumption in the world's fourth-biggest market up 4 percent in 2013 to a record 446,392 tonnes, according to the All Japan Coffee Association. "At 100 yen, 'conbini coffee' is very attractive for consumers," said Toyohide Nishino, the association's executive director, adding that he was "shocked" when he first tried Seven Cafe. "Everyone else has to be feeling an impact, however minimal." "It's a step up from canned coffee," said Hengtee Lim, a contributor at coffee website sprudge.com, calling conbini coffee "serviceable". "Starbucks will be fine - their audience is less about coffee and more about dessert drinks and a place to hang out." 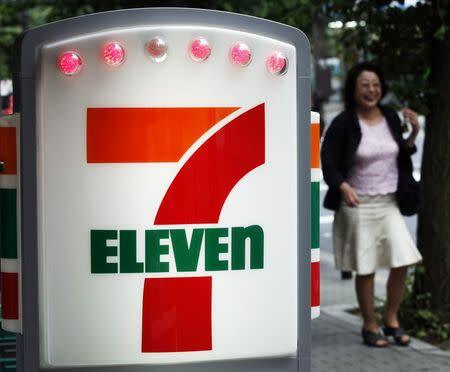 "No other convenience store does this, and neither does Starbucks or Tully's," said Seven-Eleven Japan director Yasushi Kamata. "I can't tell you that," Kamata said, smiling cryptically. "We first wanted to get the taste of black coffee right."